If any movie deserves a toyline, it's the Princess Bride. This classic comedy is finally seeing one thanks to the folks at NECA. These action figures have been in the works for over a year, and were pushed back a few times, but the initial release is finally here. 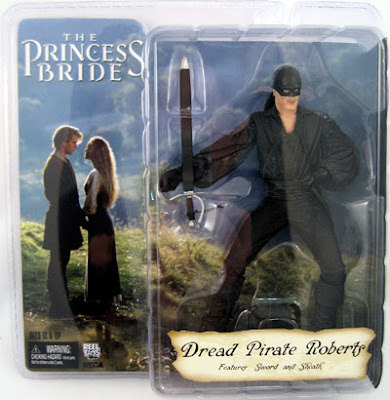 The first figure in the line, Dread Pirate Roberts, is due for release this week. He comes dressed in his black-masked pirate outfit, complete with sword and sheath. He is sort of a "preview" figure for the line, with 2 upcoming waves planned featuring: Wesley, Buttercup, Indigo Montoya, and Prince Humperdinck. NECA has stated that if sales go well they also hope to make some 2-packs, such as a Fezzik & Fezzini set. Inconceivable!